Moomau holds the Olathe North record for career interceptions with 19, and that very well could be the top number among any Sunflower League school. He helped Olathe North to three state championship appearances as the starting safety, and he was your prototypical ballhawking defensive back. Ginavan, also a safety, was tremendous in run support which is part of the reason he ranks so high on the list. He combined for 200 tackles and five interceptions in his junior and senior seasons, helping Olathe South to a state championship appearance in 2007. Parks was a great all-around athlete on the football field, but he might have had the best individual season of any defensive back as a junior in 2002. During that season he snagged 11 interceptions, four of which came in a week five game against SM North. In his junior and senior seasons, Williams combined to collect 10 interceptions. It wasn't just the quantity of interceptions that made him special, but rather when he made big plays. Three of his seven interceptions as a senior came while covering the 6-foot-10 Willie Cauley of Olathe Northwest in an all-important Regional Round playoff game. Despite being a bit undersized (he was generously listed at 5-foot-9) Williams proved to be yet another lockdown corner for Olathe East. In 21 games as a junior and a senior he combined to intercept 14 passes, becoming the top shutdown corner in the league in the late 2000s. Much the way he did on the offensive side of the ball, Parks' shiftiness allowed him to be one of the top players in the league. He used his agility on defense to shut down some of the league's top receivers as a senior and with Derek Miller playing behind him at safety, Parks was able to take more risks. Technique wise Jones wasn't exactly the greatest cornerback in the history of the league but his freakish athletic ability made up for the lack of fundamentals. 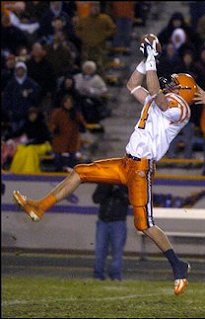 As a senior in 2004 he intercepted 8 passes including three in one game against SM East. Hammons recorded 12 career interceptions, including seven in his senior season. His efforts as a senior earned him all-metro and all-state honors. He was among the group of top-flight talent from Olathe South that failed to make the playoffs in 2000 and 2001 because they were in the same district as the might teams from Olathe North. Lamb is one of the more unheralded players of the Olathe North dynasty of the early 2000s, and some of that may have to do with the fact that he missed all of the 2002 playoffs with a broken hand. Regardless, he was a stellar defensive back who on two separate occasions intercepted three passes in a single game. Willard wasn't the most athletic defensive back we've ever seen but he was a solid corner and he helped Olathe North to three consecutive state championships during his time on the varsity level. As a senior in 2003 he snagged seven interceptions, including the game sealing interception in the state championship against Hutchinson. My jaw dropped when I saw all of those East DB's. I'm not saying they dont deserve the honors though.